I’ve been using Swagbucks for a few years now and it’s proven to be a consistent and easy way to earn some extra money for my family. Admittedly, I haven’t been using it to it’s full earning potential, but I’m trying to change that and I’m ramping up my strategy to earn more. So I thought I’d share some of my tips with you on how to start earning Swagbucks for gift cards today! Swagbucks is a website where you earn by doing simple tasks such as searching the internet, watching videos, answering surveys, playing games, etc. Once you earn enough bucks you can turn them in for prizes or gift cards. I normally turn mine in for Paypal or Amazon gift cards. They have many more gift cards to choose from such as Visa, Walmart, iTunes and Target. Click here to sign up. It’s fast and easy. 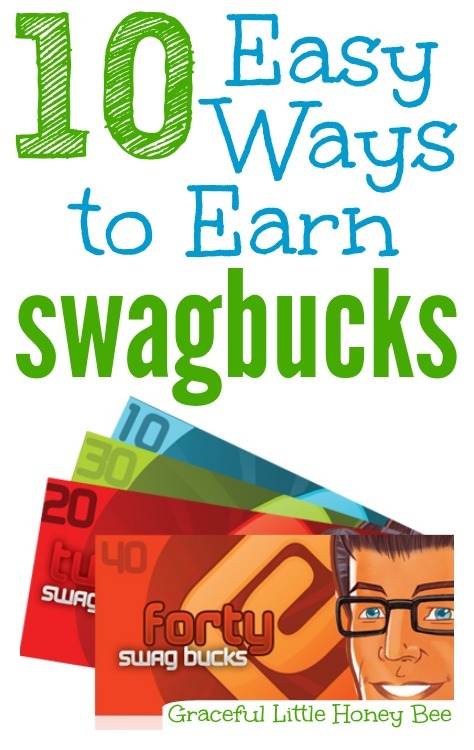 Below are 10 easy ways to earn Swagbucks today. 1. Make Swagbucks your homepage OR install the toolbar. This may sound annoying, but I really believe that having easy access will get you into the habit of visiting and earning everyday. It’s helped me a ton. Plus, you get 1 Swagbuck everyday just for having the tool bar installed. 2. Answer the Daily Poll. 3. Click through the NOSOs. You have a chance to win Swagbucks every time you search so search several times per day. I suggest doing real searches periodically, not spammy ones all in a row or you may get into some trouble. 5. Download the SBTV & EntertaiNow Mobile apps to your phone. Using these apps on a daily basis is a great way to earn. I’ve been letting them play in the background while I’m making dinner, cleaning the house, etc. and I’m earning money in the process!! You need to check it every so often to make sure you don’t need to click on something to keep it going. Plus, keep it mind that they will run your battery down. 6. Perform tasks (mostly watching videos) with Encrave. To do this you will go to the “Discover” tab at the top of the homepage and click on “Encrave.” A lot of times you will have to stay close to keep switching to new videos. When someone signs up under your referral link, you will automatically earn a portion of what they earn. Honestly, I don’t spend a lot of time doing this because it can be frustrating to sit for 30 minutes and not qualify for anything, but when you do qualify you can earn lots of bucks pretty quickly! If you use Swagbucks to click through to other websites to make purchases you will earn for every dollar spent! You can print coupons through Swagbucks and earn 10 SBs per coupon redeemed! This is awesome for those of us who coupon already! Swagbucks sets daily goals and if you meet them then you get bonus bucks. Also, if you meet your goals for a certain number of days you will earn even more bonus bucks!! Also, be sure to check the homepage for easy earning opportunities. They usually have several ways to earn (normally by watching ads or videos) that can help you reach your daily goals. The ones that pop up consistently for me are, “Take a Discovery Break”, “Earn 2 Swag Bucks” and “nGage.” These change all the time so keep your eyes peeled for more easy earning opportunities! There are tons of other ways to earn such as playing games, performing tasks, finding swagcodes, filling out special offers, etc but I feel like these 10 that I’ve shared are the easiest and quickest ways to earn! Are you on Swagbucks? If not, click here to sign up. If so, what is your favorite way to earn? Both my husband and I are avid swagbuckers! I have to be careful to not go over my data plan because one month I was so into using swagbucks that we had overage charges on the cell phone bill...oops! My husband loves doing the surveys. I like watching the video clips and the tasks that take less time. Love hearing how others use swagbucks. Thanks! When watching SB TV, how do you keep it streaming? I have to keep clicking the next video, which means stopping what I'm doing. I must be missing something. Thanks! On SBTV (on the computer) you have to click through each video, but on the SBTV mobile app on your phone or tablet it will play continuously unless it freezes on an ad or something. I hope this helps!